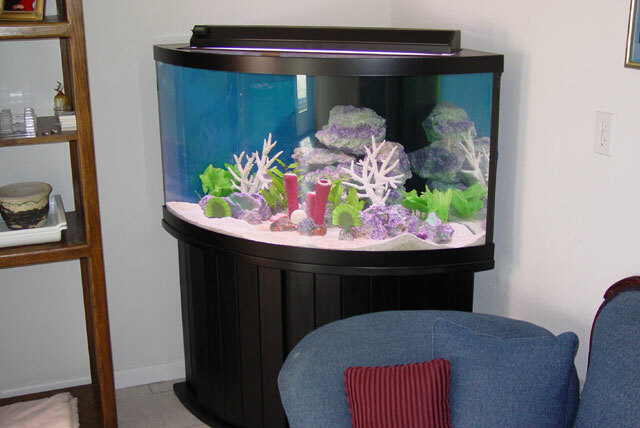 I'm looking at 92 gallon corner tanks. They are stated to have dimensions of 48"x34"x24", but given the odd shape, I'm not sure what that means, besides the height, obviously. Here is the shape of the tank. 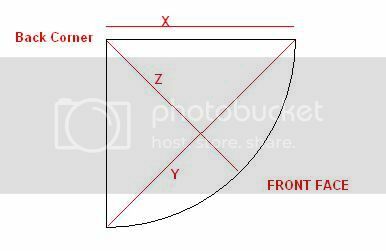 I think perhaps the 48" refers to the length from side corner to side corner, which I've labeled "Y", and that the 34" refers to the length from back corner to the middle of the bow front, which I've labeled "Z". If I'm correct this would make "X", the dimension I'm particularly interested in, 34". So maybe THAT's what the 34" refers to. hmm. Anyhow, anyone have experience with this sort of thing? Can you confirm or correct my reasoning here? followup: Assuming the arc is circular, X is the same as Z. Duh. That makes me almost certain that the tank's 48" from front corner to front corner, and 34" from back corner to any point on the front arc. That leads to another question - on a freshwater tank with no HoB or sump, with filtration handled by canister, how much space do you need between the back of the aquarium and the wall? So, the radius is 34" swept through 90 deg, the length of the chord is 48", and 24" be the height. Why pretend there are no stupid questions? Actually, There are many stupid questions: "Should I drink this bleach?" Is just one example. Having said that, Just because it's a stupid question doesn't mean that it shouldn't be asked. It's better to know. A warm beer is better than a cold beer. Because nothing is better than a cold beer, and a warm beer is better than nothing. two year old thread. I should know, since I started it... and then I got a 75 gallon to put there instead. Well, That's two in quick succession. Hopefully it is out of my system. :-P.